I've got into buying fresh gear lately. I think it happens when I get stilted, a bit stuck, fed up, and need something to get me excited about what I'm working on. I've bought some new coloured Triplus felt tips - my other ones lasted 5 years, mustn't grumble - 12 fine line Poscas in black, a tower of A3 sketchbooks (I get through those at an alarming rate), and an array of fine white brushes. These beautiful inks were discovered by Leigh as he roamed a new-found blog called Made In The UK. 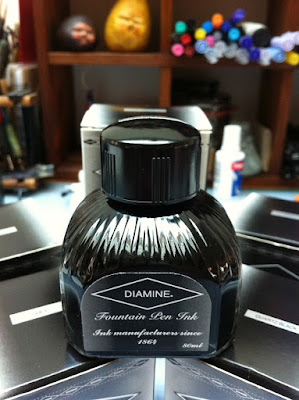 As a high-level consumer of black ink, and as advocates of buying anything manufactured in the UK, I had to have some. 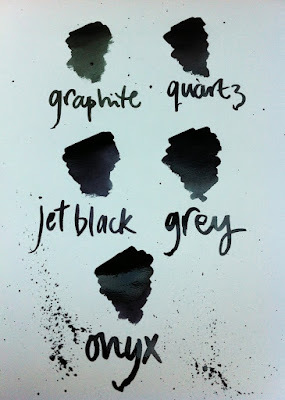 I wanted 'black', but naive fool that I am, I didn't anticipate that there would be five blacks: Graphite is greenish grey, Quartz dries with a little blue to it, Jet Black is the closest to a pure black, with some purple in it, Grey is what it says, and Onyx is the most opaque. They all dry with the same immediacy and wash out well with water, and bleach through like my previous favourite, Quink. 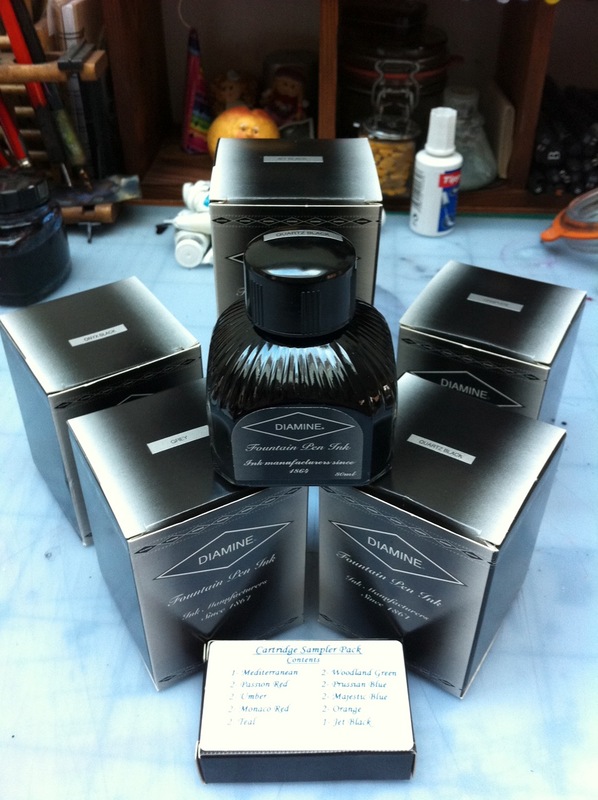 And just look at the beautiful italian-made bottles with Bakelite-style lids. How could you not want to dip your finest nibs in it every day of your life?